Most everyone who owns a car knows all about the need to change the oil. Maybe it is the constant advertising from quick lube joints or perhaps it is just common sense that a fluid designed to protect your engine and keep your car running smoothly would need to be maintained properly. 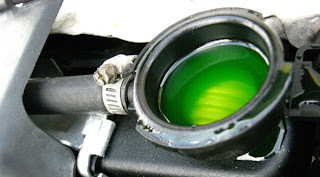 When considering your car's maintenance needs, don't forget about the coolant! Your coolant is also a fluid designed to protect our engine and keep your car running smoothly. In a normal engine, the coolant runs through the radiator, around the transmission, into the engine block, through the water pump, into your heating system and back again. Poor quality coolant can result in overheating, a lack of heat, poor engine performance, water pump damage, and even permanent engine and head issues. Over time, your coolant breaks down due to high temperatures and can create gunk that clogs the cooling system. Every couple of years, you should do a coolant service. Our Coolant service will flush out your old system and replace your coolant with new, treated coolant. The treated coolant has a stabilizer in it that will help keep the coolant from gunking up your water pump and cooling system.